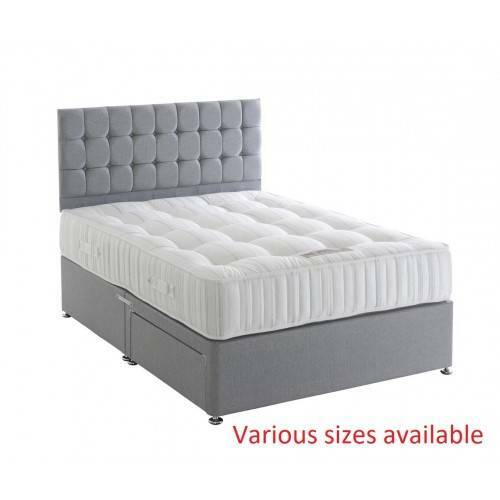 Balmoral pocket spring divan set is made in the UK by Dura Beds A quality renowed manufacturer and member of The National Bed Federation. Well respected throughtout the mattress industry for its quality products. Providing a firmer medium firm supportive mattress and a quality base, filled with super comfort traditional fillings to provide a wonderful nights sleep. Hand-tufted luxurious fillings, in Quality Damask fabric. Made to British Fire Standards for domestic homes. Hand Tufted for greater durability. Chrome gliding feet, helps avoid compression marks on the carpets.